Here’s The Winning Doodle! (I Have More Doodle News, Too!) – Hey, Look! A Writer Fellow! 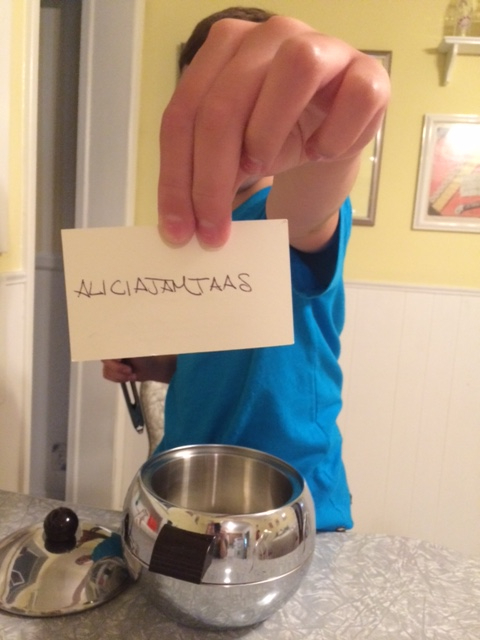 Last week the lovely and talented Alicia Jamtaas was the big winner of the Mike Allegra Win A Doodle Contest. Her prize was a custom made doodle of anything she wanted. What she wanted was raven shape-shifter. Fantasy stuff is not really in my wheelhouse, but I figured I’d come up with something. I visited Google Images. There I discovered that no one on earth seems to agree on what a raven shape-shifter looks like. So I winged it (so to speak). Here’s your doodle, Alicia! I hope you like it. DUE TO POPULAR DEMAND, I AM NOW ACCEPTING DOODLE COMMISSIONS! That’s right! You no longer have to win a contest to get your very own doodle. You just need to pay me. Click on the Hire Me! menu above for rates and details. Have a great summer everyone! I’m going to miss you! Here, lemme give you a big hug. Previous postAnd The Winners Are…. lol, yes! The sequel we’ve all been waiting for! The Return of the Doodler! Brilliant! Turnabout’s fair play, right? Even though it—ah—flies in the face of all I hold near and dear to my heart. Poor, poor kitty…. You and the other cat fanciers are safe (for now). The victim is a squirrel. Don’t you know how I draw a cat by now? Yes, I was explaining to Laurel that I have a cat bias. I should have noticed the difference in the face and tail. It’s easy to see now that my blinders have been removed. My bad. But I’m pleased that no cats were injured during the creation of this doodle. Only pesky squirrels. How could you do this to one of your own? Sadly, the poor little squirrely angels do it to themselves. Please support my crowdsourcing campaign to create a network of elevated rodent crosswalks to prevent future tragedies. I’m sure the squirrels would give you an endless supply of nuts to support the campaign. The vultures, OTOH, will take a dim view of having a major source of their meal tickets eliminated. I’m not my vulture’s keeper. Oh, my friend, you are brilliant and a little evil. I’m sort of speechless at how screamingly funny this naughty doodle is. I love that there’s a Whatcom County sign too! This is a moment to celebrate. Now there are not one but two original Mike Allegra doodles in our darling little county. This bodes well for the Allegra Doodle Retrospective we are planning. Yay! I always wanted a doodle retrospective! But, hey, I’m not a little evil! We will have to come up with themes, including the “More Evil Series”! I fear that would be a very easy series for me to draw. That pleases me. There’s enough cute and cuddly stuff in the world. Bring on the evil doodles! All I can say to that is another MWAH-HA-HA! And Whatcom County gets a shout out! 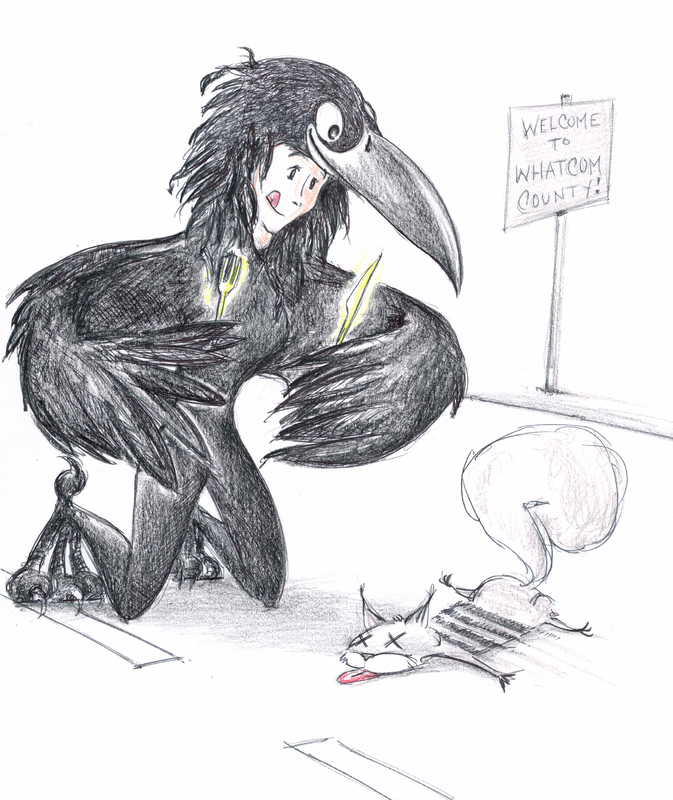 You can’t be implying that shapeshifters in the form of crows regularly dine on cat roadkill in Whatcom, can you? They’re much more likely to be dining on salmon and oysters sans the tire marks. Here I must defer to Alicia as our resident expert on shape-shifters. I also think the fluffy tail implies squirrel. Oh, Writer Fellow, what did the car run over? It looks like a squirrel but knowing your unlove of cats, is it a cat-squirrel shape-shifter? Well, there has been a lot of cat doodle talk on this blog, so I can see where that bias may have originated. I have never met a Maine squirrel. That will be on my list of critters to check out next time I’m on the other side of the country to stalk Mike for more doodles. You are right, Laurel; the drive by victim is a squirrel. Considering that Jilanne has two (Can you believe it? TWO!) Allegra cat doodles, she would know what one would look like by now. She does live in the Dogpatch though, so cats there might look a little different by default. I’d like cats, too, if they looked and acted like squirrels. Man, you are admirably consistent in your detestation of kitties. The only time I see ravens in nature is when they’re noshing on dead stuff along the side of the road. So this shape-shifter is in her natural habitat. Mike, you have done a magnificent job. I absolutely love my doodle (and secretly suspected you knew nothing about selkies). And to do all that research to boot! Thank you! for my Whatcom County shape-shifting raven-woman-raven-woman-ra . . . P.S. Contrary to popular belief, I think the dead critter is a squirrel ~ not someone’s pet. Yay! You like it! I’m gonna mail it out to you tomorrow. You and your Whatcom cohort are correct, of course. The poor, dead fellow is a squirrel. Of course it had to be a cat depicted as road kill…..oh well. Have a great summer Mike! You deserve it. I shall savor the extra time to write and doodle. Catch ya in September, Tiger. Have a great summer. I look forward to the returning doodles. 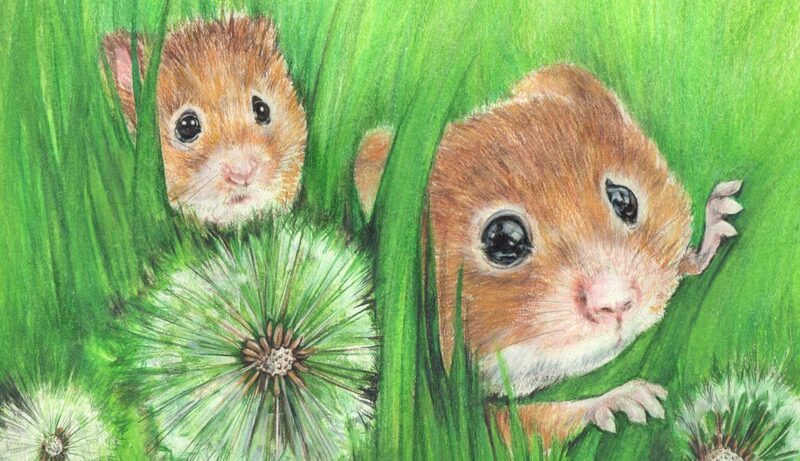 I shall be sure to replenish my doodle reserves during my absence. See you soon, Michelle! Excellent. The more doodling the better. Oh, a Mike Allegra original is a smart investment, sure to increase in value! Act now! And this year I promise to *actually* be back in September. I eagerly await your pestering. WOWWWWWWWIE!!! You really out did yourself with Raven Shape Shifter. And a dead cat too. 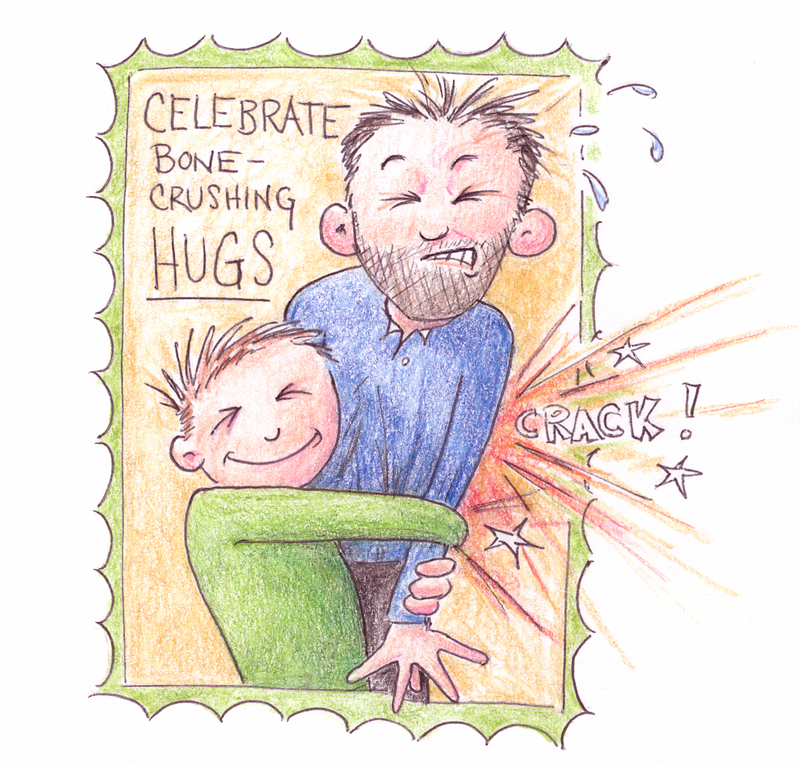 Thank you for the bone crushing hug too. Dang, I better go back to art school! Wonderful shape-shifter. Love the added meal. Nice touch. Thank you, my friend. I do like to put a little dose of silliness in my doodles. I am so sorry that I mentioned the word “cat” when it’s really a squirrel. Very sorry Mike. It is quite obviously a squirrel…..
Oh, pish, Jilanne. I just like ta give you a hard time. BTW: Your book is on its way! Woohoo! Will have to tell Rem and Liam to look out for it while I’m gone. Thanks!!! Enjoy your summer, my friend. I shall look forward to seeing you again! Take it easy, Commish. Enjoy the tourist season! Why am I smiling so much at your doodle? Maybe because we’re having a squirrel battle here in our little neck of the woods. No one is winning but the squirrel, though, not the ravens/hawks/owls, not the cars, not even my guy, who chases Mr. Squirrel up a tree with claps and bad words. I think I’ll share this Allegra original with my guy – bring a squirrely smile to his face. Do let your guy know that going head to head with a squirrel is a futile exercise. Those critters are clever and ornery. I think that’s why I like them so. I have always been a big fan of clever and ornery herbivores; that’s why I also like goats. Oh, and have wonderful New England summer, blog buddy! A raven shape shifter? Is there really every day something new I learn? Oh, yes, it is. You and me both, Cecilia! Have a rad summer, Mike! You too! Don’t vandalize and park benches while I’m gone. I’ll do my best. I’ve already cranked the AC up to 11. 11 as in 11 degrees, or 11 out of 12 on the cool factor? lol Some like it hot, I like it cool! That Whatcom County art exhibit is gonna happen, so help me! Just came across your blog, very fun! I’ll be looking forward to your return! Thanks, Minca. In the meantime, do feel free to check out the 180-or-so posts I’ve already written — ’cause, well, someone’s gotta do it! I can’t believe how talented you are! Keep it up, my friend! I just discovered your blog, and you seem to be a nice person, too!